Welcome to the world of NIU! These oracle cards utilise many of the teachings of classical Tarot and combines them with a Maori cultural framework to create an intuitive ethnic guidance. The word NIU comes from an ancient Maori ritual which involved casting rakau (sticks) for the purpose of divination. How these rakau fell determined the outcome of a prophecy, forewarning, or spiritual message. He Tangata Matauhi translates as ‘one who foretells the future’, an oracle or divine messenger - a privilege usually bestowed upon a Tohunga Matakite (foreteller of the future). 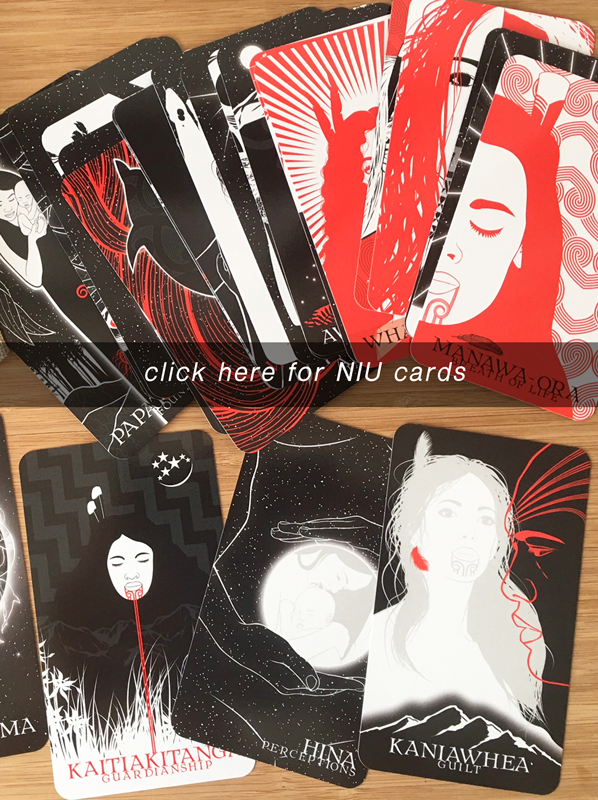 The NIU Maori Oracle set contains 56 unique Maori influenced cards. A 393 page published guide Ebook accompanies the deck (which is available separately through IBOOKS, AMAZON KINDLE and PDF FLIPBOOK), outlines and describes the meanings behind each card. Like Tarot, their purpose is to trigger and stimulate our intuition so that we may bring self-awareness to the present. In other words, they help to reflect on thoughts and actions in our subconscious and conscious mind. Being creative has always been part of who I am, although not necessarily always part of my life's journey. As a teenager I held a lot of interest in tarot and oracle cards. I think I was drawn to them because I thought they possessed some powerful wisdom to for-tell the future. Hugely misguided, I now know a lot more about how they work and about their abilities to bring insight to current situations - basically stuff we already know, deep down. 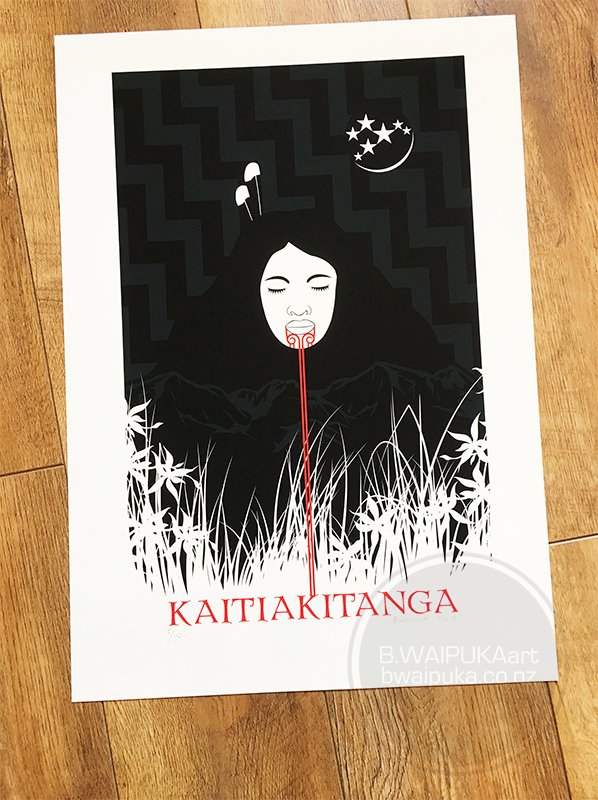 I was never able to relate to the images fully though and so always had it in the back of my mind to one day explore the idea of creating my own oracle deck, but a Maori version. I just didn't realise then how difficult and time consuming that task was going to actually be! Throughout my three year journey I had come to some insightful conclusions which had me learn some painful and valuable lessons. One profound view I came to terms with is that we are all spiritual beings experiencing a human existence. Maori have always had an infinity with Wairua (Spirit) - expressed through our Whakapapa: our Tupuna, our beliefs and stories. Everything is connected to the earth in one shape or form, and everything has it's own mauri (life force). These deeper aspects of our culture are really beautiful to me and so I always feel compelled to express these in my mahi (work)... it's what heals me and keeps me grounded. Because creativity is such a powerful thing. It's part of Te Ao Wairua (Spiritual World), which can help to open the mind. It virtually is as though we have the ability to reach in and grab this essence from the spiritual realm, bringing it to be with us in the physical realm. It is a true avenue for healing and well-being. This is something I absolutely believe in. Creating the NIU deck has come from this sense of wanting to bridge the spiritual and physical worlds for the purpose of healing and insight. Being able to see, as well as touch, the cards is hugely important. For me, It's as though I am holding my Tupuna in my hands, carrying them around with me wherever I go. Another important feature are the stories and meanings that go with each image. When we tell our Maori stories, it is a way of keeping them alive ... keeping the Spirit of our Tupuna alive. In fact, concept ideas, writing the guide booklet, and hours of research would not have been possible without the continuous guidance, messages and tohu (signs) from my Tupuna. Believing in their presence gave me the confidence to complete the project. In turn, the experience helped me to believe in myself and to walk in my own mana. This is a very profound thing. Looking back to the beginnings of my NIU journey, I feel so grateful to have been given this creative guidance and teaching. What I've learnt the most .. what it really boils down to is essentially everyone is trying to achieve a level of balance in their lives. We are all experiencing our existence through our senses, which is how we determine meaning and purpose. Unfortunately though, many of us are still fast asleep, having forgotten who they really are, which are infinite spiritual beings radiating from one light source. I look at it as if we're each a wave in the ocean... our collective ebbing and flowing of our energies (negative and positive), are constantly moving, vibrating and merging within this single mass of liquid expanse. We're all connected. And we're all here given the freedom to make our own choices that directly impacts the outcomes of our own life's journey.